The group is going on a little excursion today. 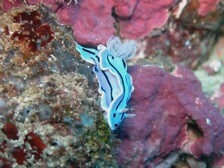 Starting at Sinai Divers the trip will head to Lighthouse − into the heart of Dahab. This spot is where the practical open water part of the IE will take place in a few days. Because the Lighthouse area is sheltered from the wind the conditions to learn scuba diving are perfect throughout most of the year. As usual the day starts in the classroom where the IDC candidates conduct their briefings. Everybody conducts their briefings professionally now. Sigrid is still here. After a lengthy conversation with Nancy and her team she decided not to leave the course. While loading the pickup there is plenty of hustle and bustle. After yesterday’s horrific student (Nancy) the overall atmosphere is much better. Everybody seems to enjoy the change of scenery. 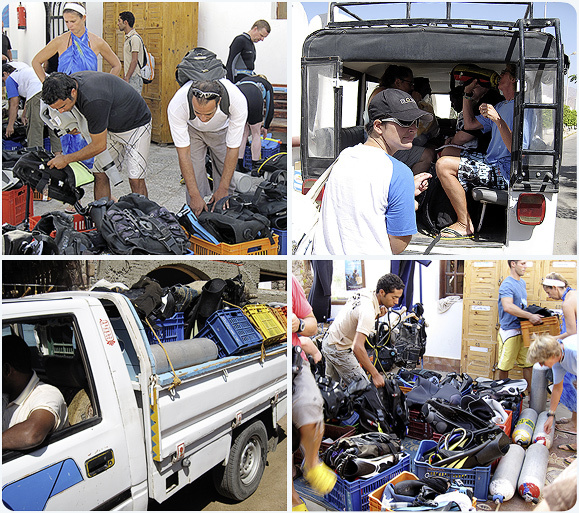 After unloading and preparing their equipment the group goes into the water without delay. We attract attention. Not every day the sunbathing tourists see a crowd of more than 15 divers entering the water at the same time. The well-known role playing game starts again. The instructor trainers assign mistakes to the students again today. After the candidates are told that Nancy − the nightmare of all instructors − will not be among the students today it takes a load of their minds. The exercises start with a surface skill from the Rescue Diver course. 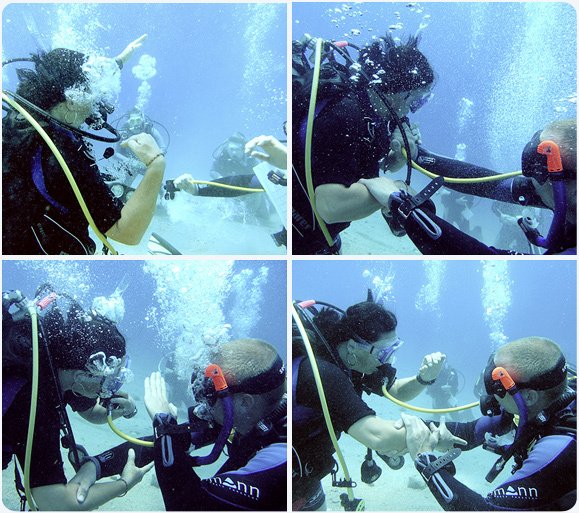 The instructor (Hugo) demonstrates how to approach a panicking diver at the surface. First you try to give commands such as, “Inflate your BCD. Drop your weights.” Jane is shouting these commands at the wildly thrashing Leeanne. It doesn’t seem to work. So Jane grabs Leeanne’s tank from behind. Now the panicking diver is defenceless and Jane can easily fill Leeanne’s BCD with air. In the next exercise Lucy descends with the students down a nine-metre line. She simultaneously takes two divers into the underwater world. The instructor trainers have secretly assigned various mistakes to her students. Giovanna obviously did not listen to Lucy’s briefing and lets go of the rope. Lucy reacts quickly and signals to Giovanna to keep her hands on the rope. At the bottom Nancy and Hendrik demonstrate how to react to a distressed diver with no air. Nancy is signalling a panicky “no air”! Quickly Hendrik offers his alternate air source and tries to calm Nancy down. “Breathe deeply and calmly,” he is signalling. After the situation is under control both give the signal to go up to the surface and the demonstration ends. Ramy is able to teach his students how to hover neutrally in mid water. Alvaro seems to be very talented and does not make any errors. Rashad is doing a great job with the CESA today. He seems confident and his students hardly have an opportunity to make any mistakes. It looks professional. Alvaro asks his students to tie knots. 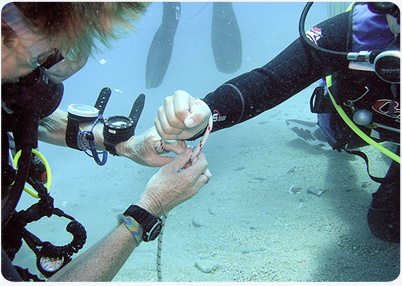 It is not always easy to identify an incorrectly tied bowline under water but Jane and Hugo cannot dupe him and they have to repeat the skill until the knot is tied correctly. The final skill for the instructor candidates is an exercise with the compass. Under the guidance of the instructor the students have to swim a specific distance using a compass without changing direction. Once they reach the destination they have to head back exactly 180 degrees. 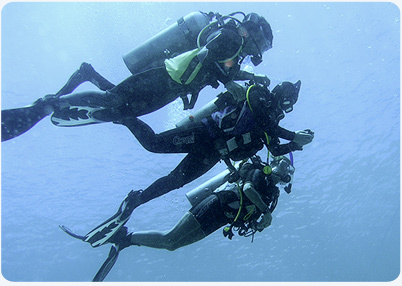 Students should maintain neutral buoyancy while doing this skill with the compass held correctly. 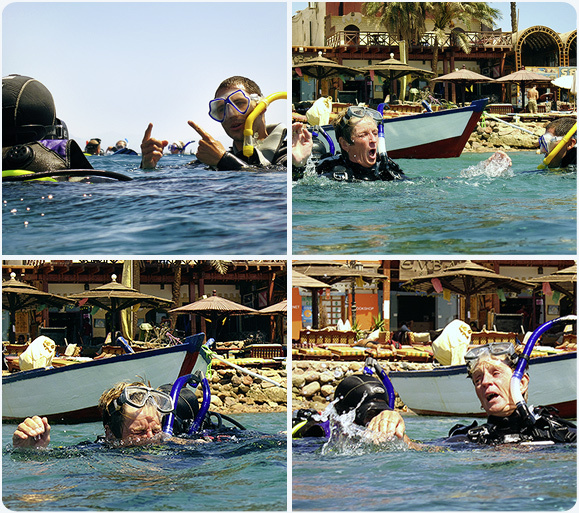 It seems get around that there is some action under water at the moment in Dahab. Once again we have some onlookers. Besides several smaller fish that scurry around the group we spot a moray eel. 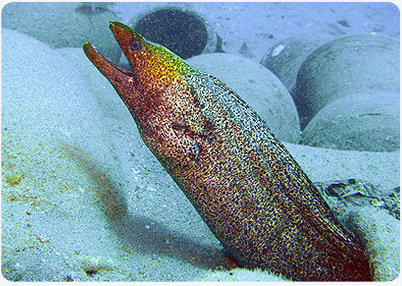 Moray eels are often seen with a half-open mouth; their significant number of teeth seems a bit threatening but usually they are peaceful companions. Nonetheless, we respect its space. After a 75-minute dive we head back to Sinai Divers. The little excursion obviously did everyone some good − the atmosphere is cheerful. Unfortunately that does not change the fact that the candidates have to spend the rest of the day in the classroom conducting presentations. Tomorrow is the last chance to practice in confined water. There will also be more exercises from the Rescue Diver course. This evening the tired participants have to prepare their assigned skills on their own using the instructor manual. According to Nancy’s team tomorrow is very important for the instructor candidate’s confidence. Let us wait and see how professional our participants will act tomorrow.